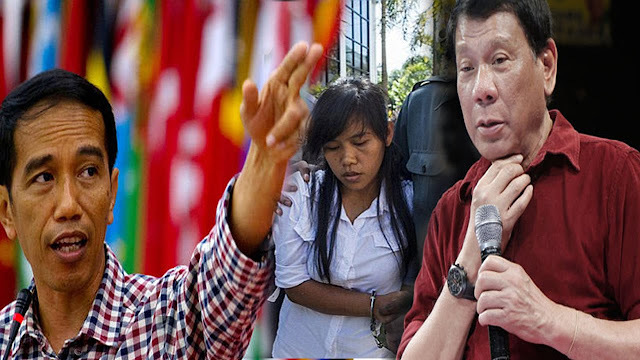 MANILA - President Rodrigo Duterte on Friday again said he will bring up the case of overseas Filipino worker Mary Jane Veloso with Indonesian President Joko Widodo. "Those are one of the things that are there. Maybe I’ll, I’ll… As a Filipino, I have a stake there also," Duterte told reporters when asked if he will seek the commutation of sentence for the OFW. "But I’d like to thank them in advance for the reprieve," Duterte added, without elaborating. Duterte also said even if he will bring up Veloso's case with Widodo, he "will honor what the laws are in their country. We will not impose. We will not demand. Nothing." Veloso was sentenced to death in October 2010 after she was caught with 2.6 kilograms of heroin at a Jakarta airport. Speaking to ANC, Widodo said he was not ruling out clemency for Veloso, but said it would depend on prevailing laws in his country and how the court would rule on the case. "I respect the prevailing laws and regulations in Indonesia. Same thing goes for Mary Jane Veloso's case," he said in Bahasa. Widodo also stressed the need to protect migrant workers while not compromising ties of Southeast Asian countries. "Indonesia respects the rights of Mary Jane and I know, Mary Jane is also facing cases in the Philippines. Therefore, the cooperation between the governments of the Indonesia and the Philippines is very important in resolving this issue," Widodo said. Indonesia stopped Veloso’s execution in 2015 after the Philippine government said her testimony would be vital in the case against her alleged illegal recruiters, Maria Cristina Sergio and Julius Lacanilao. But in a recent development in Veloso's case, the Court of Appeals, in a resolution dated March 24, granted the petition of her recruiters, who argued that securing Veloso's written deposition would be prejudicial to their rights to confront witnesses face to face. Veloso’s mother, Celia, went to Malacanang on Wednesday to press the Duterte administration to make sure that her daughter will be spared from execution in light of the new developments in her case here.